I recently got a bit of script tattooed on my left wrist to commemorate defending my dissertation. I left my successful defense and hightailed straight to the tattoo parlor. My dissertation was a combination of a critique on the power of fetish objects in contemporary poetry and my own manuscript of poems titled Spectral Evidence. I have always been obsessed with mystery and magic. My poems tend to focus on the power of belief and un-belief, imagination, witchcraft, talismans, dark fairy tales, and folk magic. I got the phrase there are such things in small cursive script. The tattoo was inspired by Tod Browning's 1931 film, Dracula. I wrote about it for Luna Luna here. In short, the phrase is never uttered in the film itself but during a live epilogue given to the theater audience by one of the actors, Edward Van Sloan, (Dr. Van Helsing) after the film's initial viewing. "Just a moment, ladies and gentlemen! A word before you go. We hope the memories of Dracula and Renfield won't give you bad dreams, so just a word of reassurance. When you get home tonight and the lights have been turned out and you are afraid to look behind the curtains — and you dread to see a face appear at the window — why, just pull yourself together and remember that after all, there are such things." To me, there are such things is an nod to the imagination, the occult, belief in the unexplainable. I am fascinated in the pull of mystery. Why not have a beautiful piece of art to carry a bit of mystery with you throughout your life? Here are some other lovely folks who also decided to get a bit of mystification inked on their bodies. Below they share their occult-inspired art and the inspiration behind it. "This tattoo was done on my arm by my friend Tea Leigh ( who is Insta famous and a witch). What drew me to this tattoo was my own occult practice, and also how much it reminds me of the Edna St. Vincent Millay poem, First Fig. When my altar is lit in all my drippy candles and I think of my own drippy candle-adorned arm, I feel the magick growing. It also reminds me of the very first time I cast a spell that had HUGE results and transformed the way I look at personal forgiveness, setting intentions, and transformation. Sometimes, I color my candle in in fun colors based on what I am calling into my life." 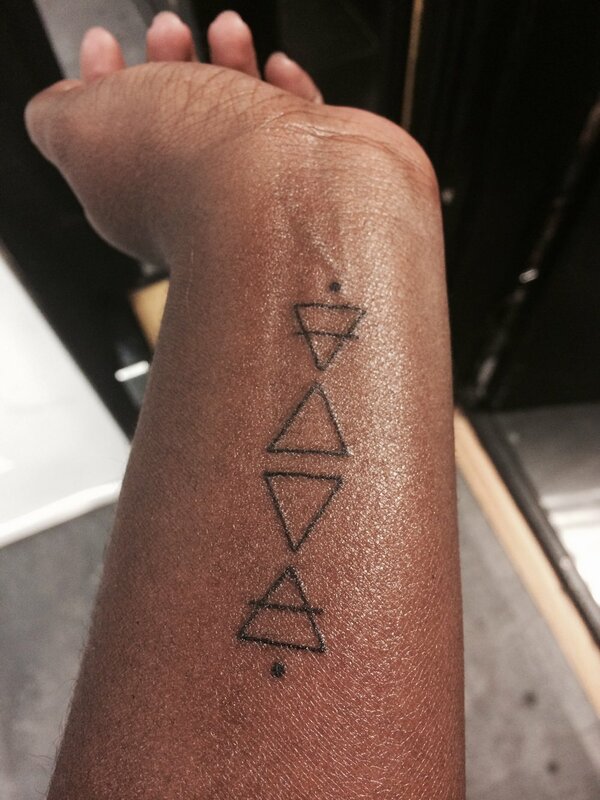 "The four basic elements inspired this tattoo: earth, fire, water, air. I got this tattoo to help me acknowledge the magic in the mundane. Every time I see it, I'm reminded of the balance and harmony that exists inside of me and everything." "This isn't science. It's more like black magic. As a film fan with a love of classic cinema it was inevitable I’d love the Universal Monster movies but the one that holds a very special place in my heart is The Bride of Frankenstein. She is by far the most recognizable female character in horror, her image has been recreated and reimagined by artists that only a cursory glance at Pinterest will prove. The titular character of The Bride has no lines of dialogue and has only five minutes of screen time but she steals the show and has stolen the hearts of millions of horror fans, myself included. My decision to get my Bride tattoo was based on my love of this iconic character and my love of artist Alphonse Mucha. My love of the Bride is based partially in my feminist roots, despite the themes of male dominance within the film it is she that is remembered. Pretty little thing, in her way, wasn't she? Denied a peaceful rest after death, denied a choice in her being married off to a monster, she rejects the monster. She defies the men and, of course, it ends in her death. Welcome to the patriarchy! The Bride represents and challenges ideas of beauty, autonomy, and identity. What’s not to love?" "I got this tattoo for my 29th birthday. It highlights my sacred geometry from my astrological natal chart. I got it to always remind me that I am part of something bigger, that there is more in this world than what is immediately apparent, and that maybe my unique expression of energy is here for a reason. A month after I got it, I learned that my mom had been giving me the wrong birth time for years. When I ran my chart with the corrected time, some of the lines in this tattoo were no longer present. At first I panicked, but now, I love this because it reminds me to take everything with a grain of salt and also to appreciate timing. Just fifty-five minutes is enough to alter the composition." "I became a little obsessed with black Phillip after watching The VVItch last fall. I was even Black Phillip for Halloween. I just love how the whole movie looks and feels. It's so creepy and kind of sad. I have other creepy tattoos and I'm drawn to dark imagery. It's so interesting to look at. I never really liked scary movies/spooky things as a teenager so it's kind of weird that I ended up this way." Trista Edwards is a poet, land mermaid, light witch, horror enthusiast, creatrix, traveler, and dog lover. She is also the curator and editor of the anthology, Till The Tide: An Anthology of Mermaid Poetry (Sundress Publications, 2015). She is currently working on her first full-length poetry collection but until then you can read her poems at The Journal, Quail Bell Magazine, 32 Poems, The Adroit Journal, Sou’wester, Queen Mob's Tea House, and more. She writes about travel, ghosts, and poetry on her blog, Marvel + Moon. Trista is a contributing editor at Luna Luna Magazine.